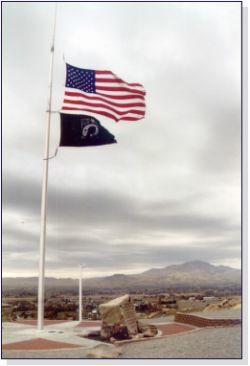 November 14, 2003 In the cold and blustery morning of Veterans Day a cadre of men and women from American Legion Post 49 and others gathered at Freezeout Hill to pay tribute to veterans by lowering the American flag to half-mast. The stark black and white POW/MIA flag was also lowered in tandem in memory of our nation's POW/MIAs. The tribute was just the latest of several that have taken place at the site since its initial dedication a little over a year ago. The completion of the brick walkway, retaining wall, and stone wall have effectively tied the monument and flagpole into a cohesive memorial site. The walkway already contains 491 engraved bricks dispersed throughout the wedge shaped segments and additional orders continue to be taken. When you read the various inscriptions they seem to evoke a snapshot of the diversity of our nation. They pay respect to members of our armed forces, veterans, firemen, policemen, doctors, lawyers, politicians, mothers, fathers, children, as well as aunts and uncles. There are bricks for local residents as well as others from across the country and surnames that tend to reflect a multitude of nationalities. Christmas is just around the corner and if you are looking for a unique and lasting gift for a loved one you might want to order an engraved brick. Arrangements can be made to notify the person that a brick has been ordered in their name as a Christmas present. We already have over 60 orders and when we reach 125 we will arrange to have them engraved and will install them just as soon as they become available and weather permits. The memorial seems to be increasing in popularity and American Legion Post 49 is committed to continue improving and maintaining it. The latest addition to the site will be the placement of two concrete benches, donated by area resident Jack Blevins, that will provide visitors the opportunity to relax while they reflect on a loved one or just admire the Emmett Valley. Should you want more information about ordering a brick please contact Jim Olson at 365-7738.